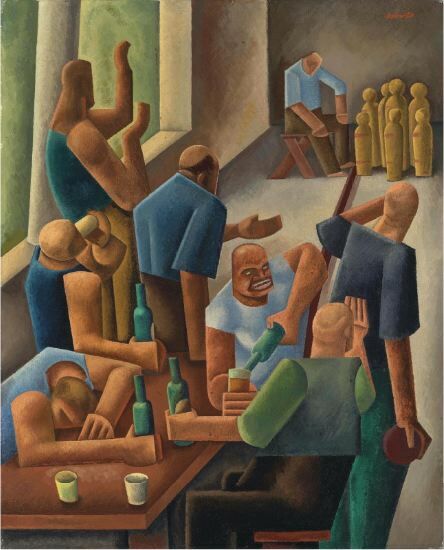 While William Roberts is rightly characterised as a quintessentially English artist, the sale in November 2013 at Christie's of The Bowling Alley 1927  'inspired by a visit to Germany' according to the catalogue of the 1965 WR retrospective  prompted me to reflect on the European influence on his work and the stimulus that travel abroad provided with regard to subject matter. Roberts's time at the Slade coincided with the sensational Second Post-Impressionist Exhibition of 1912, which broadly speaking introduced the London art world to Bonnard, Cézanne, Derain, Matisse and Picasso. Writing in 1957 Roberts explained that he 'became an abstract painter under the influence of the French cubists; this influence was further strengthened by a stay in France and Italy during the summer of 1913.' His experience of active service in northern France was powerfully explored in his war subjects of 191819, and as he moved to non-war subjects he obtained an unusual commission from Osbert and Sacheverell Sitwell. Following a visit to Modigliani's studio in Paris, they had decided to put on an exhibition of French art in London, and Roberts was to design a poster promoting the event. The exhibition included work by Picasso, Modigliani, Léger, Derain and Dufy, and Roberts's poster design is in an uncompromising 'cubist' style. 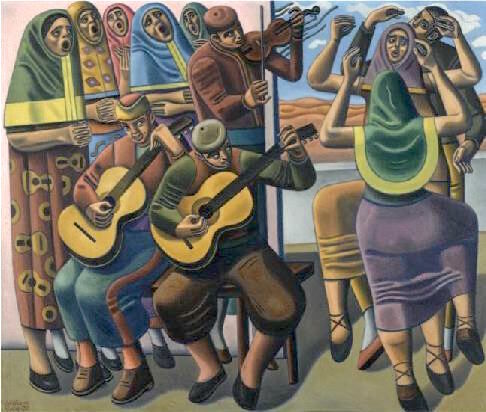 However, in this immediate post-war world there was little appetite for 'abstract' art and, just as Picasso and Derain's work of the time can be regarded as a 'return to order', so Roberts was to turn to recognisable scenes of everyday life  albeit in an original visual style that drew upon cubism, Vorticism and expressionism. His seeking-out and emphasising of geometric forms through the simplification and exaggeration of especially cylindrical shapes has led to his figures being described as 'tubular' or 'tubist'  a term originally coined as a derogatory reference to Fernand Léger's idiosyncratic version of cubism. The French influence on Roberts's visual style was coupled with a positive outlook towards European culture. Initially this was experienced through the immigrant community of the East End and his wife's Russian Jewish background; later it was through the restaurants and shops of Fitzrovia and the bohemian lifestyle of artists in the London of the twenties. Holidays for the Robertses were presumably uncomfortable affairs, as they were always on a shoestring budget and dependent on the goodwill of friends for accommodation. Photographs of William and Sarah Roberts in Paris may have been associated with a honeymoon in the early twenties. In the later twenties they certainly took a holiday in La Ciotat near Cassis in the South of France. Cassis had attracted artists such as Matisse and Derain, and in the twenties it was to become associated with a number of British artists, including the Bloomsbury set and the 'Scottish Colourists'. Edward Wadsworth, a fellow Vorticist and purchaser of Roberts's large painting Dock Gates, visited the area in 1921 and 1924. 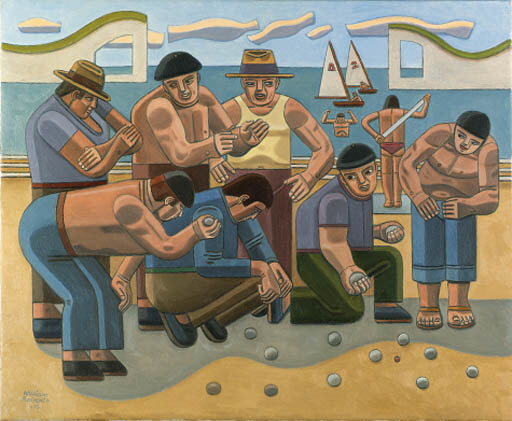 Roberts's holiday in the South of France, probably in 1927, provided the material for at least three works: Loading Ballast, Bullfight and French Peasants. Loading Ballast (aka The Mazeppa) is an attractive large watercolour that invites comparison with Wadsworth's calm French marine scenes of this time such as La Rochelle (1924). Bullfight exists as two studies, and the date on the Pallant House watercolour (1928) makes it likely that it depicts a French rather than a Spanish bullfight. French Peasants exists as a watercolour study and as a large oil painting (also known as The Labourers) now hanging in the library of King's College, Cambridge. It is a striking vertical composition of male and female workers in a field, and the availability of such subject matter to Roberts, as a passer-by, led to Spanish and Italian variants being produced in the thirties (Spanish Peasants) and in the sixties (Italian Peasants). Around the time of the Cassis holiday Roberts also travelled to Germany in a party led by the bookseller and publisher Charles Lahr and including the writers H. E. Bates and Rhys Davies. The group sailed from Gravesend to Rotterdam, and then travelled via Cologne and Mannheim to Lahr's birthplace in Wendelsheim. This trip was extraordinarily productive for Roberts, as the three works it inspired  The Prodigal Sets Out, The Rhine Boat and The Bowling Alley  are among his best. 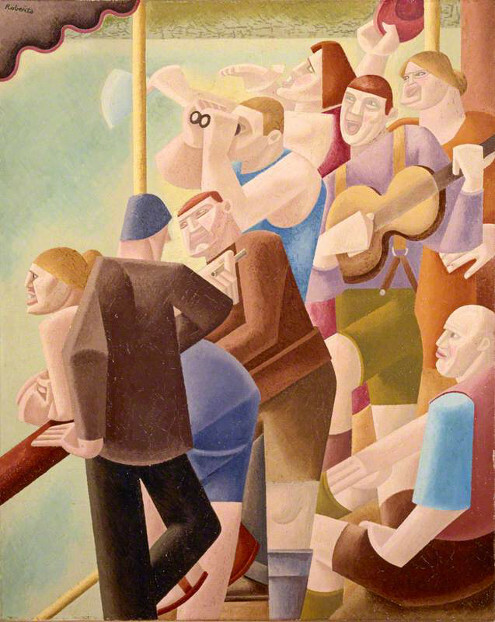 The Rhine Boat (in the Scottish National Gallery of Modern Art at Edinburgh) is a humorous portrayal of tourists in a 'tubist' style. The Bowling Alley perfectly captures the non-verbal communication and psychological interplay in a working men's bar. In the early thirties the Roberts family was offered the use for two or three weeks of the flat in Alicante of the brother of their friend Agustín de Irízar, lecturer in Spanish at Leeds University. They initially aborted their trip when, arriving at Victoria station, they found the fare was 5 more than expected, but the next day the London rain persuaded them to go after all. The Family (aka The Peasants) and Spanish Beggars date from this holiday, while Spanish Rhythm, a depiction of a Spanish folk dance, was painted a few years later. It is not known whether the wonderful 1931 painting of cyclists Les Routiers (Ulster Museum, Belfast) was inspired by a direct encounter by Roberts with the Tour de France, but it seems to depict a distinctly European approach to what might otherwise have been an English activity. In their later years William and Sarah continued to visit the Mediterranean countries  Italy and Greece being two destinations documented  but it was Spain for which they had a particular fondness. They sometimes accompanied their son, John, when he attended guitar courses there, and bought a troublesome donkey cottage in Bédar in Andalusia. When Roberts's friend and patron Ernest Cooper retired in the late sixties he bought a property in Spain, and the Robertses stayed there on more than one occasion. As late as 1976  when Roberts was 81  he visited Etretat on the Normandy coast. The cliffs there had been an attraction for many artists, including Gustave Courbet and Claude Monet, and two of the famous natural arches are alluded to in the background to Roberts's painting Boule Players at Etretat. However, as the title suggests, Roberts was particularly drawn to that most French leisure pursuit  boules. A fascinating comparison in both style and subject matter can be drawn between The Bowling Alley of 1927 and the Boule Players completed almost fifty years later.